This week I’m spending a few hours every day to fill the freezer. By spreading it out over several days, I avoid overtiring. And our week is just too full to leave it all for one big cooking session. 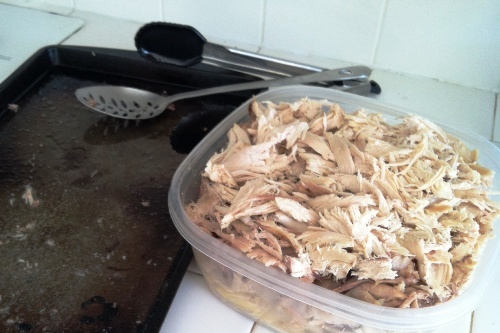 On Sunday I pulled two whole chickens and a pork roast from the freezer to thaw and then to cook up and use in casseroles, sandwiches, and other freezer meals. Last night I started the chickens in my slow cookers. I’ve been cooking roasts and birds this way for years. While it is a little weird to wake up to the smell of cooked chicken or beef, it is nice to have something accomplished before I even wake up! Plus, starting the day with cooked meat, I can spend the next few hours assembling meals with that meat. No more burning the midnight oil, waiting for meat and cassseroles to cool before I put them in the refrigerator. This morning when I woke, I had two chickens to debone and shred the meat. I ended up with 14 cups of chicken! This ended up going into Chicken Bacon Subs, Chicken Divan with Cheddar Crust (cookbook recipe), Creamy Chicken Enchiladas (cookbook recipe) and Chicken and Onion Wraps (cookbook recipe). Baked chicken is wonderful to keep on hand in the freezer. Chop the cooked and cooled meat and store it in 2-cup portions, airtight, in the freezer to use in recipes, fill sandwiches or burritos, or to top salads. Sorry for teasing you with all those cookbook recipes. It wasn’t intentional. Those recipes just sounded really good to me this month. Use your slow cooker overnight to give yourself a great headstart on freezer cooking. The Chicken Bacon Subs look good! Have you ever tried them with the frozen(thawed:) grilled chicken? @KellyinPA, I haven’t made them with grilled chicken, but I bet they would be really good that way! Yum. : ) I have my cookbook preordered! Can I ask how you season your whole chicken (or do you)? I have fallen off the whole chicken in the crockpot bandwagon and want to get back on this fall. Suggestions? I’ve done it before with my kitchen aid, but I didn’t like the texture. Pretty inconsistent. And with the whole chickens, I was worried about missing a bone, so I did it all by hand. You know, I always make my chicken stock in the crockpot overnight (so I know what you mean about waking up to that smell – totally freaked me out the first couple of times, until I figured out what the smell was! ), but I never thought about cooking whole chickens or roasts overnight. Great idea, thanks! I have my cookbook preordered and I can’t wait. I would love to see pics of your new chicken recipes. They sound yummy! I have my cookbook preordered and can’t wait till it comes! I just wish it was going to be out sooner!! Football season started for us last night and I’m definitely behind on figuring out what we’re going to have on practice nights. It has to be a meal that I can serve early enough, but can be digested easily enough by my player. The fact that I’m still in summer mode and by that I mean “lazy” mode, probably isn’t helping!!!! Sweet idea! I am going now to get out a whole chicken to thaw. I will cook it Friday night. Our A/C is broken and we will be without air until MONDAY! We are grilling and using the crock pot all weekend. No added heat to the 80 degree kitchen. Looks like I need to get your book! I made chicken in the crockpot too! The last time I did a chicken in the crock pot I really enjoyed it – this is on the must-do list when my pantry challenge is over. I’d also have to shred it by hand. The last time I used the kitchen aid mixer the texture was very mushy… and my husband was NOT a fan. If you don’t mind though, it really sped up the process! @Tiffany @ DontWastetheCrumbs, that was my experience, too. Been doing this for four decades, glad you’ve ‘discovered’ and shared it. So excited about your cookbook! Have you ever started with whole frozen chickens? I’ve done it with breasts before and it works great but i’m nervous about putting in the whole bird frozen. Thanks!! The food science that I’ve read strongly recommends AGAINST putting frozen food in the slow cooker. So, I never use frozen meat in my crock pot.